The slopeback tender was developed to give the engineer better rearward visibility for switching moves. An engineer could usually see his own rear coupler. The tender couldn't hold nearly as much water as a regular tender, but switchers rarely were far from water anyway so it wasn't a problem. The Aristo Slopeback tender comes with a basic analog sound system. The only sound that it makes is a chuff which is not very well synchronized with the engine speed. It sounded ok until I began to install digital sound systems in other locos when it paled by comparison. I elected to install a Soundtraxx Sierra system in the tender behind an Aristo Rogers 2-4-2. 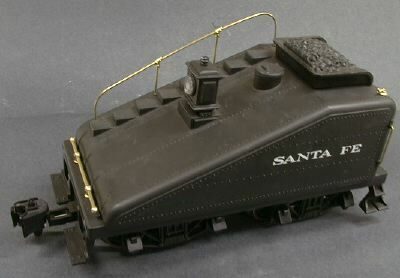 Since Sierra doesn't have a sound system customized for this loco, I just listened to the sound samples on the Soundtraxx web site until I found one that I liked and didn't have already. I ended up with the sound for an EBT 2-8-2. The first thing that I did was strip everything out of the existing tender. There was nothing there that I wished to retain except for the power wires from the trucks. The 2" speaker is a good one for its size, but I wanted a bigger one, and the stock speaker is not mounted to provide the best sound output. The sound board itself was scrapped. Even the power switch is not usable because it has only one pole and I prefer to disconnect both the track power and the battery when the system is turned off. This takes a dual pole switch. The 3" speaker supplied with the Sierra can mount over the ring in the tender floor, but I chose to use a better oval speaker that typically comes with computer speaker sets. Look for a sale for "non-amplified" computer speakers and junk the cabinets. The speakers are fine. I saw a set advertised for $0.99 on sale at Fry's Electronics. The oval speaker was too tall to mount in the existing speaker location, so I choose to mount the speaker toward the front of the tender and to mount the battery where the old speaker was. 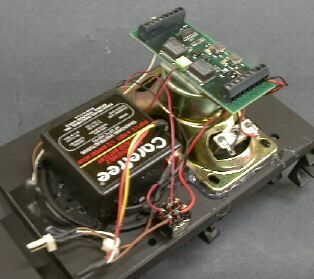 This is especially convenient because the Sierra board itself can be mounted on the back of the speaker so that it is accessible through the coal load. The coal load unlatches by pushing the water hatch to the rear. This makes it unnecessary to mount a remote volume control switch. An array of holes needs to be drilled under the new speaker location to let the sound out. The speaker didn't fit until some grinding was done on the old speaker ring. The new speaker covers over the hole where the wiring to the front truck used to go. Since there are now only 2 wires, they were rerouted up through two of the old speaker holes. The rest of the holes were plugged with hot glue. The hole for the rear truck wiring is plugged by covering it with electrical tape. The rear headlight runs from track power and is non directional. It used to plug into the sound board to pick up its power. Since I don't like to hardwire the tender shell to the tender floor, I removed the two pin connector from the old sound board and soldered wires to the pins that were in the board and then wired it to track power. A 1N4000 type 1 amp rectifier diode can be added in series with the rear light to make it directional if desired. If it comes on in the wrong direction, just reverse the diode. The Sierra can be set so that its chuff rate is roughly proportional to the engine speed, but this method really doesn't work too well. I prefer to use a synchronized chuff by installing the supplied reed switch and magnets. 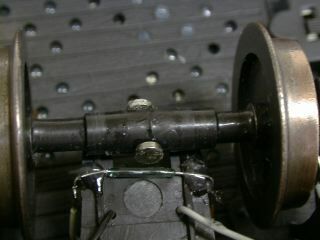 With 2 magnets on a tender axle, the chuff rate is about 3 chuffs per turn which is fast enough. It also changes with engine speed reliably except when the engine is slipping. 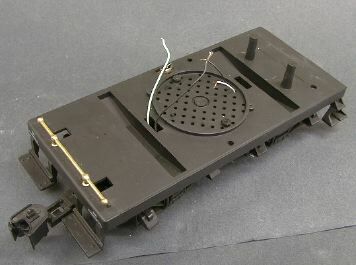 It is a lot easier to wire the switch within the tender instead of running wires to the loco and finding a place to mount the switch and magnets. This page has been accessed times since 11 Mar 00.